An alligator swims Friday, March 6, 2015, in the newly renovated Mississippi Delta Country exhibit at the Tennessee Aquarium in Chattanooga, Tenn. Renovations to the exhibit included the addition of 13 small new alligators. Download the Tennessee Aquarium's free app, which offers a schedule of events and programs, along with an interactive checklist of all the animals to see. José is no longer the lone gator in the tank. The Tennessee Aquarium has hosted one alligator at a time since it opened, but now the Delta Swamp exhibit is home to 13 male American alligators — and José is learning to share his newly revamped home. "He has blended right in with the new alligators," said Dave Cheris, an animal care specialist at the aquarium. "He is becoming one of the pack." Friday marked the grand opening of the aquarium's newly renovated Delta Country Alligator Bayou, which re-creates the feeling of being in a coastal swamp with overgrown vegetation and tree stumps. Visitors walking through the exhibit can watch the alligators during feeding time and as they lie in piles atop logs. The glass walls of the open-air tanks allow everyone to watch as the scaly reptiles use their long tails to propel themselves through the water. A shack made of rustic wood rests on the far bank of the exhibit, and alligator trainers emerge from it twice a day to feed fish and rodents to the cold-blooded reptiles. The new alligators aren't Jose's only co-inhabitants in the exhibit's three open-air tanks. There are turtles, more than 10 varieties of fish and an assortment of birds. Ben Stenger, a senior aquarist, said he and his team have been working for months to diversify the fish species in the tanks. "It's a true ecosystem," he said. "Some of the fish may get eaten, and others may not." The new alligators are estimated to be about 6 years old, and are currently 3 to 4 feet in length. The amount they grow is correlated with their diet, said Sara Carlson, supervisor of animal programs and enrichment. The aquarium is planning on balancing out the reptiles' diets to allow them to grow at least another foot in length at a healthy pace, she said. Carlson has been working with the alligators in an off-site facility for a couple months, training and getting to know them before moving them to the aquarium. "We have to always think about the alligators' experience," she said. "We tried to make the transition here as easy as possible for them." Carlson said she and her staff became attached to the gators during the training process. "These are not just scaly robots," she said, laughing. "They each have their own personality and [each trainer] definitely has their favorites." Dave Collins, the aquarium's curator of forests, said he has been wanting to expand the alligator exhibit for some time. Years of planning have been devoted to the expansion. Having only one alligator in the exhibit was not very exciting, Collins said, as the creature usually hid in the corner and wasn't sociable. "Adding multiple young alligators will make the exhibit much more exciting," he said. Thom Benson, the aquarium's senior marketing and communications manager, said he hopes visitors will enjoy this new exhibit, but also will learn something about these mysterious reptiles. "A lot of people think of swamps as dark and scary places where people don't go," he said. 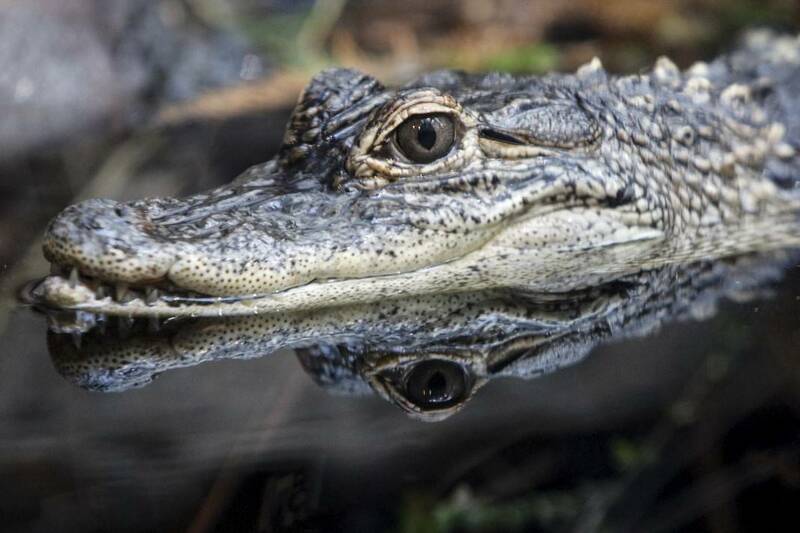 "Now people get the chance to see these alligators and how intelligent and fun they are." Animal programs and enrichment supervisor Sara Carlson feeds an alligator smelt Friday, March 6, 2015, in the newly renovated Mississippi Delta Country exhibit at the Tennessee Aquarium in Chattanooga, Tenn. Renovations to the exhibit included the addition of 13 small new alligators.